Ours turned out to be a lot of fun, and I think I may have enjoyed Schlitterbahna little too much. Don't trips to water parks make you feel like an excited five-year-old all over again? And of course, singing and dancing to the Spice Girls (er...and One Direction) while watching the closing ceremony for the Olympics counted as the cherry on top. The colossal bridge entering San Francisco amazed me instantly. I bet the locals are used to tourists (like me) hanging their heads out of car windows trying to catch every part of the city possible. Surely they realize this behavior is understandable. It was so strange to experience such a big change in climate across the city. This was our sight of the Golden Gate Bridge on the exact same day. I kept pressing my hands against the windows to feel the heat change to cold. While I was busy recovering from a mild heart attack after driving (I mean passenger-driving) up some steep roads in the city bumper-to-bumper (no photos there), my husband was sweet and booked a hotel downtown for his frazzled wife. This crazy-amazing restaurant and bar is called Ryoko's. If you even remotely like sushi, you HAVE to go here. Oh...and that's iidako (baby octopus) shown. I just about died when I had my first bite and tried not to hog the rest of the plate to myself for the remainder of dinner. 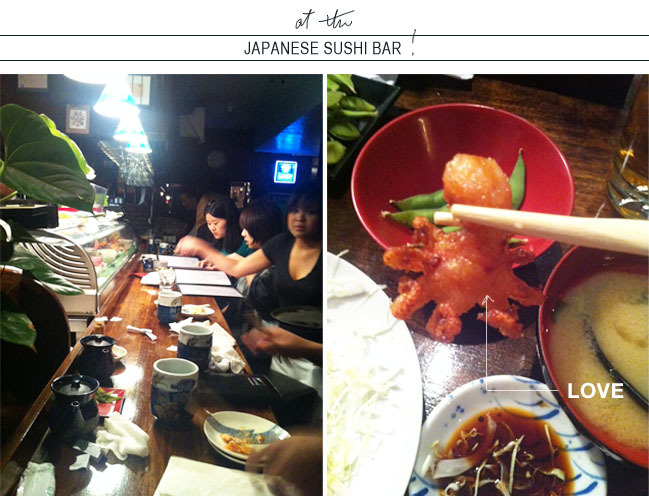 Not only was the food ridiculously good, but I also loved the atmosphere. We sat at the crowded bar and munched on our food while listening to music with a techno beat that made me want to jump off my barstool and dance with my chopsticks in the air. I wish this restaurant would move itself to San Antonio. Le sigh. of course i'm interxt vacation destination. the first thing i want to do is wait for the fog to set in and take a photo just like yours. 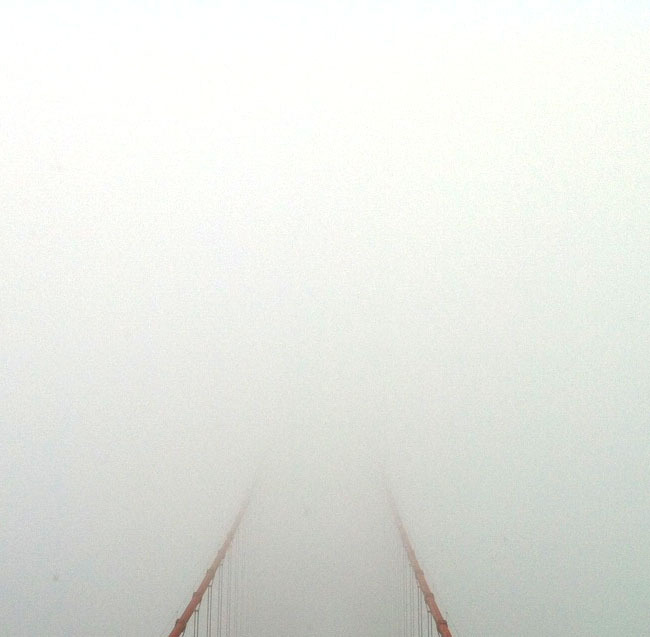 i've been loving all the different fog/golden gate combinations i've been seeing on instagram from various people. looks like so much fun! love your photos... I kinda miss the US, haven't been back there for about 12 years! Welcome back! Looks like it was a lovely trip. 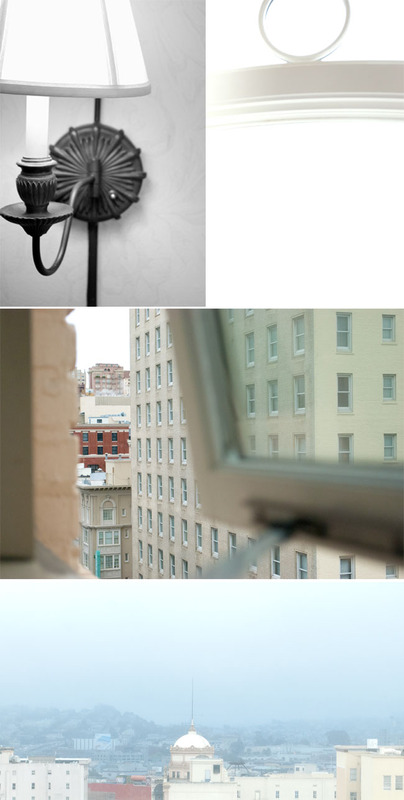 Your photos are gorgeous :) I must visit San Fran one day. Helen: You're quite the poet! :) Bah, and you didn't know it. Okay, I'll stop. But seriously, that's awesome! You HAVE to try it!! I think you'll fall in love. Leyla: Yeah, I felt so lucky that it was foggy in the beginning, but sunny in the end. Makes for more interesting photos. :) I can't wait to show you the photos from the last day of the trip! Hhm, I think I'm missing out on Instagram. All those shots must be beautiful. Jo: Thank you! It was a good time. :) Oh wow! Hope you can come back sometime soon!! Holly: Thank you so much! I have so much catching up to do! Yes, you do! Hhm, you should visit Texas someday also...specifically San Antonio. ;) Hope you enjoyed your week! Hi, Danie! I love it, just love it!!! The photos are amazing, the one with the "phantom" bridge is my favorite, it has an abstract vibe that makes me wonder about the hidden lines, fantastic!!! And of course, the Sushi at Ryoko's...I love sushi and to experiment new and exotic flavors every time I visit a Sushi restaurant...Live dangerously!!! hehe!! Ines: Hi, dear! Thank you so much! That was actually just snapped on my phone...the entire picture was actually pretty horrible, but cropping can hide some serious ugliness. That's the one my husband wants to frame. You are such an adventurer! I WISH I could experiment new flavors with you! Rhi: It's beautiful. :) Yes, it will!! And you'll be forced to take a million pictures so I can see it all. Aw, Rhi, thank you so much. That's an incredible compliment to me.